Rhodia notebooks enjoy a truly dedicated international following. 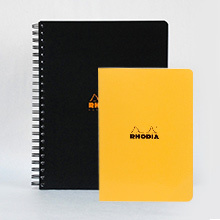 Rhodia notebooks and notepads are favoured by designers, artists, writers and stationery lovers. Featuring premium design elements and outstanding paper, fans of Rhodia notebooks include director Francis Ford Coppola, fashion icon Paul Smith, and Hermes exclusive in-house perfumer, Jean-Claude Ellena. WHAT’S SO GOOD ABOUT A RHODIA NOTEBOOK? Developed in France in the 1930s, Rhodia’s rich heritage and cultural influence is evident in the classic, stylish design, high quality and functionality in each of their notepads. Inside the iconic black and orange cover, the classic Rhodia notebook begins with sheets of smooth, premium, acid-free paper, each with micro-perforations allowing for clean page removal. Encasing the notebook is a scored front cover that folds back neatly, with a hard coated backing board gives durability. The complete Rhodia range now extends well beyond the orange pads. The range comprises Bloc Pads, Cahiers, Wirebound Notebooks, Meeting books, Limited and Special Editions, including the latest Heritage. 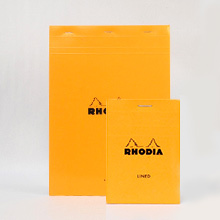 Born into a long line of paper merchants, Rhodia was started by brothers Henri and Robert Verilhac in Lyon in 1934. The notebooks quickly became a bestseller, superseding similar products on the market with their quality paper and superior design. Legend has it that the two fir trees in the Rhodia logo symbolise the two founding brothers, a lovely design element and nod to the roots of the company. Telegram Co. is the official, exclusive distributor for Rhodia in Australia. 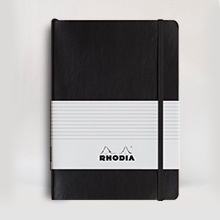 Interested in stocking Rhodia? Please complete our retail partnership enquiry form.